Happy Saturday and happy weekend! I'm here today to take part in a super-fun charity blog hop organised by Sandy Allnock! 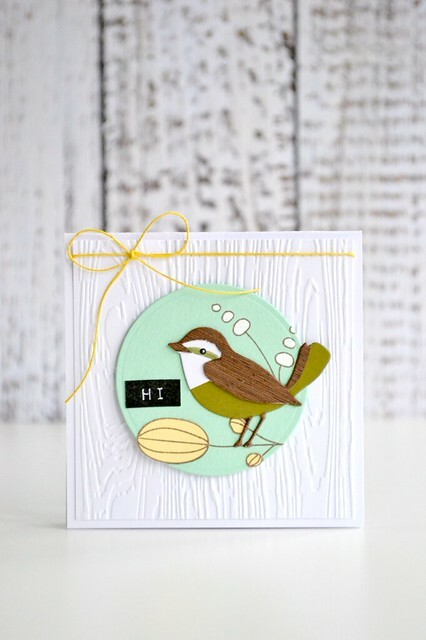 You should have hopped here from the talented Lisa Spangler, but if you haven't then be sure to start out at Sandy's blog for all the deets! This mug and card will be popping to a dear crafty friend of mine – I hope that they'll like it! As you can see, my project is a pretty literal take on the mug in both design and colours. Right, that's all from me today, but next on your hopping adventure is Jessica Frost-Ballas! Wow, what a great card. Love your inspiration and how well you recreated it. Oh my, THIS is a beauty!!! Just WOW! Beautiful card and such a lovely version of that mug illustration! Lovely! Wonderful card! It coordinates with the mug perfectly! Thanks fo rsharing your charity choice. Your bird is adorable! Dad will be proud of you! How exciting to see your blog ping back to life!! Been too long, girl! THIS is awesome - I'd love to receive this card (hint)! Look at you making such a perfect copy of that wren!! 😍😍😍😍😍 I've always loved birds too...I used to sail and we'd take members of the Audubon Society out on San Francisco Bay to birdwatch, and they'd donate to the org for the privilege. Thanks so much for joining in the hop Aimes!! Love you cards. They remind me of my mother in law. Oh how she loved birds, every trip they took she would go bird watching. She was involved in a group in her home town and donated much of her time for the good of the bird community. Oh wow! You matched the cup perfectly! What a beautiful card with beautiful detail! Such a beautiful card and idea. I so love the paper piecing you did on the bird! Wonderful card. 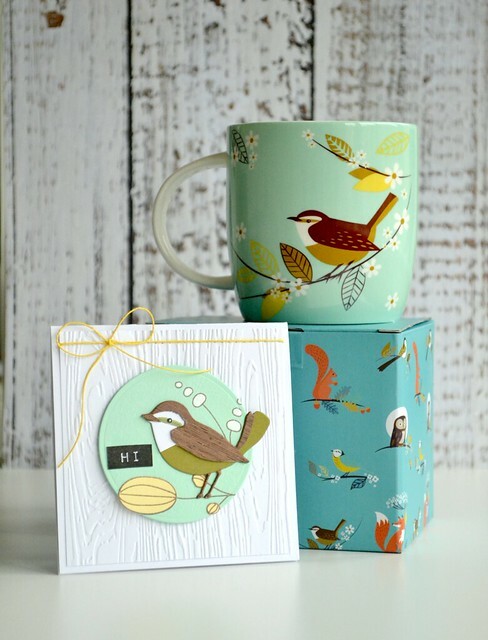 Beautiful card and a great take on the bird on your mug. Thanks for sharing. A great blog hop. I absolutely love how you took inspiration from your mug to make this card it's SO cute love it. Oh Wow!! You replicated that mug beautifully...love it!! Oh wow! 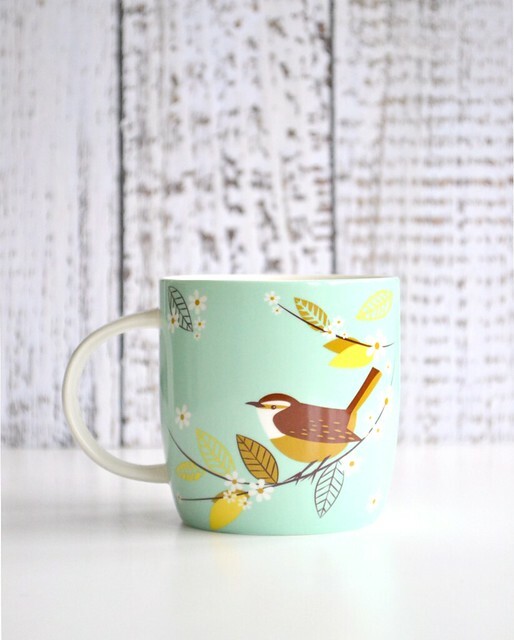 A cute mug, and a fabulous artistic take on it for your card! Oh, WOW! I am so impressed that the card matched the mug. See, that's why we NEED so many supplies. It's lovely, and I am sure the recipient will be blessed to the max. Thanks for sharing a wonderful idea and a worthy cause. your project blows me away! I truly love that mug (I think I need one too!) as well as your card interpretation of the colors and design. Stunning! Beautiful card, and I love the mug ! Really love that wood grain paper. Great for a forest scene with your robin. Thanks for sharing and for the chance to win! What a wonderful idea for a blog hop! Love the card. What a STUNNING card!! It is such a great pairing to that mug. Love your design!! Oh, my goodness! LOVE your bird. What a beautiful card for this mug. wow. Thanks for being a part of this great blog hop. Oh my!! I love this! I am a bird lover, too. Love the way you caught the vision for card from the cup! 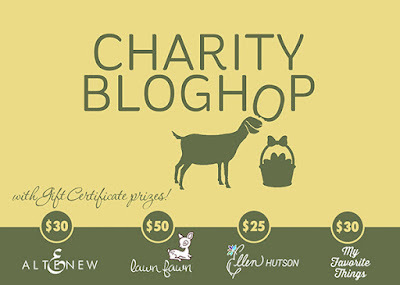 Thank you for participating in the charity blog hop! What a great card. I'm sure the friend will really appreciate the card and gift! Beautiful card and a wonderful idea to help a charity. Your bird card is beautiful, and matches your lovely mug so well! I love the combination of materials on your card. Thanks for sharing your charity, my dad is a big fan of birds too. Your card looks AMAZING! My bestie is a bird lover, I am inspired to make her a similar card. Thank you so much for the inspiration you've provided! Your card is spot on to your lovely mug! What an awesome charity!!!! And what an honor to your dad! That mug is so sweet and I love how you recreated it on your card. I adore the wood veneer paper...it creates a great texture like you said. Lovely card and mug. And a great cause! Great card. Thanks for your donation. What a beautiful card! Wonderful take on that pretty mug. I love how your inspiration piece, your card and your charity are all coordinated! Very nice! Thank you for sharing! Fantastic idea!Thank you for the inspiration! Perfect replication of the coffee mug! Beautiful card! What a great card....looks so much like the tea cup. I love the bright red of the Cardinals in winter. Such a surprise against the white snow. And I love the Blue Birds as well.Your card is beautiful and your charity is a wonderful one. We need our birds. What a gorgeous mug! And I love how you translated it into your card! Fabulous card! I'm learning a lot on these blog hops. I had no idea there was such a thing as peal and stick wood veneer. And I too love Wrens and Robins. I'm old enough that when I was in grade school there was only one other kid names Robin and he was a boy. When everyone else was going through the "I hate my name" phase I still loved mine. LOVE your card; the colors, texture and subject. What an amazing replica! Beautiful work! Awesome rendition Amy! It's super cute and pretty too. I really like that mug, it might have to fly into my cart, lol. Love this idea. Thanks for sharing and inspiring. Love your mug and your card!!!! Great charity. Even if your card is "a pretty literal take on the mug in both design and colours" it is very beautiful and elegant. I love it. What a beautiful card. I love the materials you used, very creative. I love that mug too! Lovely idea to match the mug, and so very cute. Love the colors of the bird and the design is perfect! What a lovely card! Love the inspiration! Beautiful card. You are very talented. Your ca d and mug....a perfect match! Beautiful mug and card! I love the colors! Wow, you would think the card and mug were a purchased set since they match so well. Great job! Well done! Thanks for taking part in Sandy's Charity Blog Hop! Love your card and what a wonderful idea ! This is a great opportunity for your readers to discover some new and worthy charities! Nice set of cup n card! Wonderful charity. Wow, I am liking finding out about all these charities and seeing the nice cards. I look forward to checking out all the blogs! So cute and clever how you matched the mug. Great gift. I love this so much!! I love how you were inspired to make the card from the pretty mug! Wow!!! This is such a wonderful idea!!! Love your adorable card! So cute!!! I haven't heard of this organization, but I'll definitely research it more. I love your color combination and paper piecing is so much fun to do. Wow, Aimes, your inspiration for your card from that pretty mug is absolutely AMAZING! I love any organization that helps care for and protect our beautiful birds! Thanks for being a part of this! Wow!! What a gorgeous card and I love the paper piecing so pretty and matches the cup perfectly. Thanks for the inspiration and educating me on a new charity! You did a fabulous job recreated this mug as a card. What a great idea for inspiration. I like the card. I enjoy bird watching. Oh my, I am loving your beautiful work! I love the way you translated the mug into a card! The wood veneer is beautiful. Wow! It's amazing how you paired your card exactly with the mug! So beautiful! And I like how you put some wood for the wings to give the bird some texture. Thanks for sharing! That is a truly lovely mug and a perfectly matched card, I adore it! Love your choice of charity! I used to raise small parrots, red and yellow canaries and lovebirds! Love your pretty card too! I am on various design teams and receive free product to use and promote. I geniunely love the products of the companies and all opinons are honest and my own. I'm flattered if I've inspired you and you want to CASE anything of mine, but please don't enter it for commercial publications or competitions. All designs, text, and photographs on Crafting Confessions are ©2009-2016 to Amy Gray unless stated otherwise.